Think “Art Blakey and the Jazz Messengers” for repertoire from Freddie Hubbard, Lee Morgan, Benny Golson, Wayne Shorter, Bobby Timmons, Hank Mobley and Horace Silver, plus a few of Juli’s originals. The band has been featured at the 2013 Chicago Jazz Fest, Hyde Park Jazz Society’s Room 43, the Jazz Showcase, Andy’s Jazz Club, and the Green Mill. 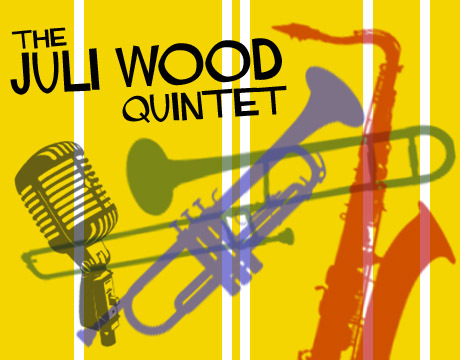 The quintet is also featured on Juli’s recording 5 4 3 2 1 Juli Wood. Juli loves to play and sing simple swinging tunes like Bobby Timmons’ Moanin’ and the old standard Bye Bye Blackbird, but she’s also a powerhouse on more complex arrangements like Joe Henderson’s treatment of Without a Song and Freddie Hubbard’s version of Full Moon and Empty Arms. 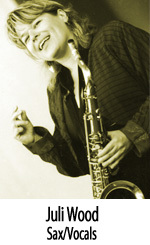 Her voice is full bodied, she phrases right in the pocket, and her tenor sax has that big Chicago sound. Juli Loves playing every Sunday with Larry and Steve in the great gospel band at Christ Universal Temple. Larry Bowen plays trumpet and Flugel Horn. He brings a big Dizzy Gillespie and Freddie Hubbard vibe to the band. Larry is a wonderful jazz, R&B, gospel, and theatre musician. He has played with Aretha Franklin, the Temptations, the Four Tops, the O’Jays, and jazz singer extraordinaire, Tony Bennett. Larry is on Koko Taylor’s 2001 Grammy nominated CD, Royal Blue. He played in the Chicago Jazz Ensemble under the direction of Jon Faddis. He is the lead trumpet for the Paramount Theatre in Aurora, IL. He was also lead trumpet for 2014’s Broadway hit in Chicago, Motown the Musical Larry also plays in the great gospel band at Christ Universal Temple. 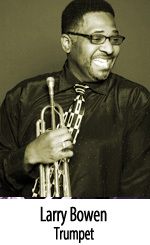 Steve Berry is a professional trombonist, educator, composer, and AACM member. He has recorded or performed with Tony Bennett, Lou Rawls, Frank Sinatra, Diana Ross, Aretha Franklin, the Dells, the O’Jays, Nancy Wilson, Lena Horne, and many more. 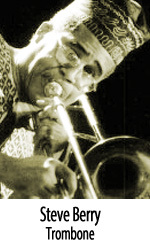 In Chicago he has performed with Edward Wilkerson’s Shadow Vignettes, the Chicago Jazz Ensemble, and Malachi Thompson’s Africa Brass and Freebop bands. He currently performs with Ernest Dawkins’ New Horizon Ensemble and has his own quintet to showcase his compositions. With Ernest Dawkins he co-founded Chicago Creative Arts Online which presents video and audio of live performances by creative improvisers in venues both locally and internationally. Steve has traveled extensively in groups led by Ernest Dawkins and Dee Alexander. He has a wonderful big brassy trombone sound and is also in the gospel band at Christ Universal Temple. 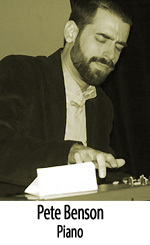 Pete Benson plays organ with the group, and he’s also a fine jazz pianist. Every Saturday night you’ll find Pete on organ with the Sabertooth quartet at Chicago’s famed Green Mill Jazz Club. He’s one of Chicago’s premiere Hammond B3 jazz organists and has been praised by renowned organ greats, Joey DeFrancesco and Chris Foreman. Pete has shared the stage with Phil Woods, Von Freeman, Ira Sullivan, Joe Lovano, and Roy Hargrove. 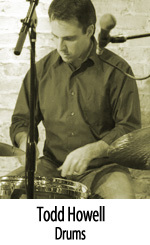 Todd Howell is one of the top jazz drummers in Chicago. He’s a Philly Joe Jones devotee and he shows it! Todd has performed or recorded with the Chicago Jazz Orchestra, Kyle Asche, Scott Burns, Jeff Morrison, Odies Williams, Tony DoRosario, and Dan Murphy. Todd is always solid and swinging!